Starting from the year of 2013, teachers, students as well as guardians had come to know a phrase, which have later become the hottest topics among the educators as well as students. HOTS, a word which really means “hot” for the candidates sitting for the exams, or more appropriate that it is so for certain candidates. In 2013, UPSR, PMR and SPM had changed their “face” by introducing High Order Thinking Skills (HOTS) questions which brought to us a lot of Facebook status updates shortly after the papers like “Owh, today’s questions’ gonna kill me!! !” or “OMG! I spent all night to memorise the Moral definitions but only two came out in the exam!”. And it tells us that, those “alien”, “uncommon” and “unfamiliar” questions had dawn a big bomb on majority of the candidates. Well, I was one of the students, sitting in the exam hall, cracking my head to think of any possible answer for those “alien” questions which we’ve never seen before, during the SPM 2013. I have to admit that, they were not easy questions. Nevertheless, I was HAPPY for those kind of questions! It proves that the spoon-feeding way of teaching that we used to at schools is no longer applicable. Let’s just talk about the Moral subject. In my school, our teacher used to print a big pile of notes and distribute to us. And we were required to read and memorise the notes. For example, for Moral the notes included the definitions for 36 moral values (you should memorise them without leaving out any word), name of government agency (which we used to translate them from Chinese to Malay), name of acts related to certain moral values (that you even think you were taking papers for Law), keywords (you know they are from the definition but you simply forgot which part of it) which is necessary for the essay part of the questions…and so on. After all, having Moral class in school is just about memorising the notes and learning the answering techniques, and you even wonder, is this what so-called Moral? Today, the introducing of HOTS questions tells us that, from now onwards we should emphasise on the ability to think instead of memorising skills of students. And that’s what education should be! In order to train students answering the new style of exam questions, I could even imagine teachers entering classes without their Moral textbooks and start their classes with any topic, subsequently guiding students to give responses on the topic. Those topics could be on our nation history, modern issues, future development, self-development, self-reflection, etc. etc. There are too much to be discussed on, and there are too much that we students had never learnt from the textbooks. And now, it has become the teachers’ obligation to lead, to give exposure and to guide students: to think on their own! I wouldn’t say the Moral questions in SPM 2013 are difficult, since we can answer those questions based on our observations from daily issues, and a little own opinion and analysis and judgement. What we need to do is to speak our hearts out sincerely and honestly. And I wouldn’t deny that the answers would reflect the way we think in our daily life. Some students might say: “You are good student and you are good in manipulating words and language, of course you could say so.” However, I am definitely against the thoughts. The ability of thinking is the basis of human being. Would you agree that students in the so-called “worse classes” do not have the ability to think and to feel? Of course they have! What they lack of are the courage and confidence to speak their opinions and feelings out. And right now it’s the chance for them to learn and practise how to voice out their thoughts. Isn’t it the way we learn? Once they are given the chance, they gain the confidence, and they tend to think and analyse more. 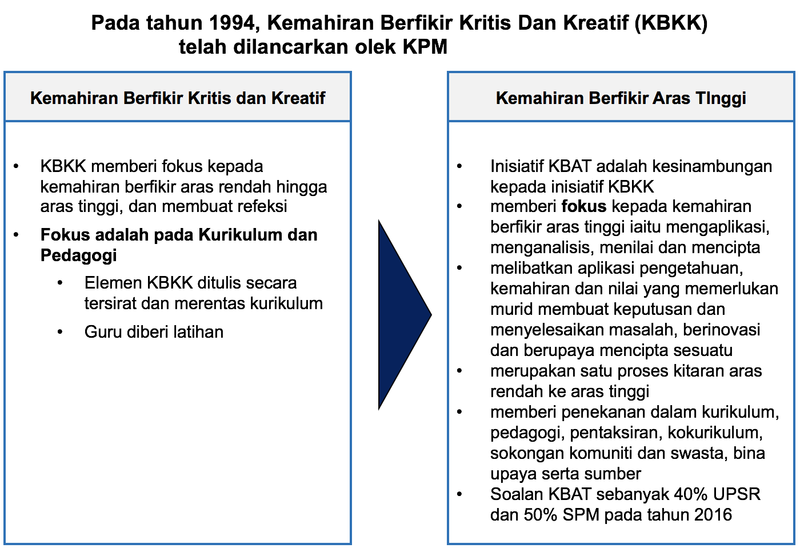 At that time, those KBKK (Kemahiran Berfikir secara Kritis dan Kreatif) questions wouldn’t be a big problem anymore for them. As such, teachers ought to make full use of the time in their classes, to create opportunity for students to think and to speak. At the same time, wise teachers would grab the chances to inculcate positive values in students, teach them to look at the good things in their life, to appreciate, to do good things to others, to analyse, to comment, to improve current state etc. Nevertheless, this really depends a lot on the interactions between teachers and students, plus the teacher’s attitude whether he/she could accept students voicing out their own thoughts. Guiding students to think is like TEACHING students how to fish; while giving notes and spoon-feeding students with all kinds of knowledge without any self-learning would be like giving students buckets and buckets of fish. And it’s really vital, whether students are following a TEACHER, or a FEEDER during their school time. At least that’s what the teachers in my school would do. I would say, revising teacher’s notes would never be enough, since you will never know what would come out during the exam. Why don’t read some other enlightening and insightful materials other than school notes and reference books? I’m pretty sure that will really help a lot in answering your KBKK or HOTS questions. We wouldn’t want our nation to be as ignorant as we were during the colonisation era, do we? And what would be the most important part that the modern society requires for further development? Would it be workers with superb memorising skills? To memorise what? Since almost everything had been computerise nowadays? Would it be creative and innovative humans? Yes, of course we need them!